For decades, the most mismanaged part of the grocery experience has always been leaving the store. As you enter, many stores have greeters, sometimes even the owners, who go out of their way to make sure you feel welcome. There are usually staff available, somewhere, when you need help finding what you are looking for. But leaving the store, and specifically going through the checkout, can often turn into a nightmare. To avoid getting stuck in line waiting to pay for their items, all the while being forced to take in the news of the latest Elvis sighting in the National Enquirer, Canadians will opt for the often dysfunctional self-checkout machines. 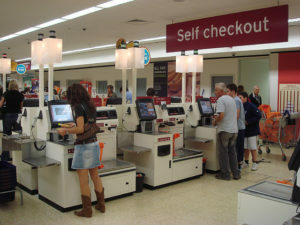 Poorly designed self-checkout lanes have been a source of frustration ever since the technology first appeared in Canadian stores in 2000. Something always goes wrong, which then requires an employee with a portable scanner to come to the rescue. The experience is, most often, embarrassing and annoying. But, despite all the flaws, Canadians are still using self-checkouts. According to a recent survey by Dalhousie University, a full 66% of us have used self-checkout lanes at some point in the past, and 11% use them consistently. Grocers have had a love-hate relationship with technology in general for decades. Most feel that technology gets in the way of connecting with customers inside the store. It has long been believed that the only way to build customer loyalty and increase foot traffic is to interact with visiting customers, as much possible. Many of us have wondered whether the poor quality of self-checkout machines was by design, to force customers to interact with staff in the end. Grocers also feared losing sales by going virtual. But the time pressures of our modern lifestyle and our constant quest for convenience have not only forced grocers to think differently about how they manage the grocery experience, but have also compelled them to seek different channels to reach more customers, such as online delivery and meal kits — it’s just not as simple as it used to be. Wanting to humanize the grocery experience is just one thing grocers grapple with. Encouraging impulse buying is an art that grocers have mastered in the brick-and-mortar environment. While you wait in line to pay for the items in your cart, you’re surrounded by candies, gum, magazines, and other small temptations. These bring much needed additional revenues to retailers who are desperate to increase their razor-thin profit margin. However, getting customers to buy on impulse in front of a screen is another story. But grocers recognize what’s coming. According to the same Dalhousie University survey, nearly 2% of Canadians buy food online regularly, and more than 34% are thinking about doing so. This is an astonishingly high number compared to just a few years ago. This means Canadians are paying attention and are slowly been drawn to solutions which can save them time, and avoid the hassle of grocery shopping. Meal kitting is also on the rise in Canada, as more than 14% of Canadians have ordered ready-to-cook products from meal kit providers, a number which is likely to increase. External disruptors like Amazon want to remind Canadians that technology can serve a purpose in the grocery business and make any visit a civilized endeavour. Amazon Go is a store in which you don’t need to talk to or even see anyone. You essentially get your groceries and walk away without paying. Sensors detect what you have picked up, and the appropriate amount is automatically deducted from your bank account. No waiting, no browsing through tabloids, none of that. Lessons such as this are being given by non-traditional grocers that there is a better way to implement technological solutions to enhance our shopping experience. The industry is going through a significant transition period in terms of enhanced technology, whether it is in-store or online. Canadians are demanding more convenience, and not just the younger generations. People with children, married people, divorced people, boomers, the middle class, anyone who doesn’t want grocery shopping to be a slog. Grocers know that consumers are expecting seamless solutions that will make grocery shopping a pleasant experience for all. But grocers also recognize that no one wants to pay more for better technology, or delivery for that matter. So, patience is a virtue. Grocers will get there, but it may take a while. If you opt for that self-checkout aisle, you can expect the dreaded “wait for an assistant” message to keep popping up on that screen for a little while longer. SYLVAIN CHARLEBOIS: Professor in Food Distribution and Policy, Faculties of Management and Agriculture, Dalhousie University.